Tanzania Flying Labs recently deployed to the villages that surround Amani Nature Reserve in the Tanga Region of Northern Tanzania to support ongoing research in assessing land use on the borders of this conservation area. A scientist from an NSF-funded project wanted to obtain visual data on which crops are planted and where, as well as any practices of boundary-marking that may be visible from above. Of particular interest was distinguishing between clove trees, non-crop trees, and other crops. Tanzania is unique amongst other countries in the world in that more than 30% of the country is protected land. Agriculture is the main employer with more than 70% of the population being smallholder farmers. In Amani, as in many conservation zones, land available to local farmers is limited by the borders of the protected forest and a nearby tea plantation. Many cope with the challenges of limited space by growing higher value crops such as cloves and cinnamon to optimize earnings from limited space. 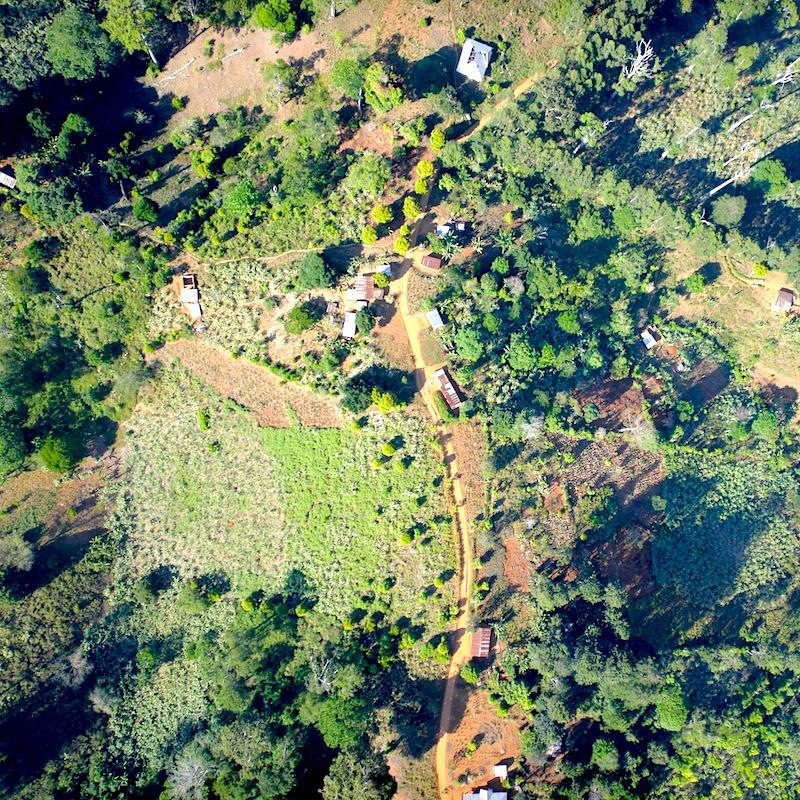 Land tenure has been a constant theme at the organization and drone data is providing more evidence that it can support land use planning, habitat extent, and monitoring of protected areas. One has to only spend a night in the woods to realize the immense value of such a place in a very innate manner and a certain sense of responsibility to preserve the flora and fauna within. But according to historians of the region, extensive deforestation of the East Usambaras began with German colonial projects to alienate land in the region for timber extraction and the establishment of cash crop plantations. While forest reserves were subsequently established and then upheld during independence, sawmilling operations rapidly cleared this important catchment forest into the 1980s. Since then, Tanzania and its international partners have worked to curtail deforestation by establishing Amani Nature Reserve in 1997 and promoting conservation programs in the region that include local residents in the effort. No use case explored can omit the technology and lessons learned from the field. The hilly terrain was very challenging to say the least – mainly because of changing elevation data. The team used a senseFly eBee to collect the data but it was the drone’s ability to compensate for changing elevation that saved the mission. Landing in confined spaces was difficult but the pilots got the hang of it after a few flights. Future similar missions will either require a longer range drone which they can launch at a distance from the area of interest or a vertical take-off and landing (VTOL) drone. Another solution is to use their own terrain data collected by the drone at a much higher altitude. The latter might be the way to go. We also recommend placing a beacon inside the drone in case you need to track it if gets lost in the woods. High resolution geospatial data is an interesting and novel approach to learning how communities interact with and react to protected areas. We hope our work can continue to explore other use-cases such as monitoring habitat loss and illegal logging to name a few – and empower both park managers and members of the local community to do the same. Ultimately, aerial data in nature conservation should contribute towards harmony between people and protected areas. The people of Amani for letting us conduct our flights on their land. Dr. Jessica Pouchet from Northwestern University for giving us the opportunity to contribute to her academic research and co-authoring this blog. 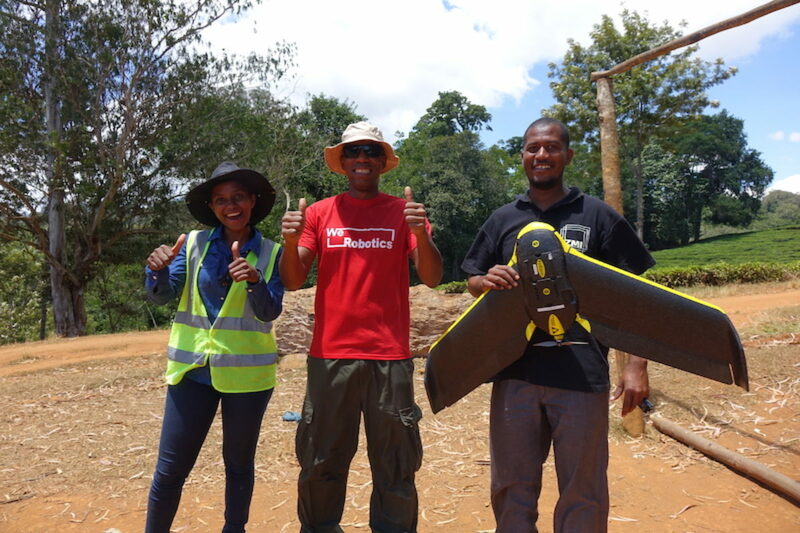 Uhuru Labs lending us their drone tracking device.